Adam Reviews the newest (and Brilliant with a capital “B”) Political Dark Comedy from Armando Iannucci, The Death of Stalin. The film stars an ensemble cast lead by Steve Buscemi, Jeffery Tambor, Michael Palin, Andrea Riseborough, Simon Russell Beale, Rupert Friend, Jason Isaacs, and Olga Kurylenko. The Death of Stalin, the newest film from Armando Iannucci may have been banned in Russia but thankfully it has not been banned from the US (…yet). Iannucci’s trademark screwball comedy and political satire mashup are present here. The film is a move forward for the co-writer and director beyond his previous Film work (In the Loop) and his much-lauded TV work (Veep). The film would seem like an arcane venture; detailing the aftermath of the death of a Communist Dictator that happened more than 60 years ago. It is anything but arcane. Sharp, focused, and directly aimed at our unsure times The Death of Stalin is not only hilarious but an evisceration of the current events. The beauty of the film is how Iannucci and fellow screenwriters David Schneider, Ian Martin, and Peter Fellows construct the story so one needs to know nothing about these events to enjoy the film. Built as a screwball comedy of the darkest order, the film begins hours before the titular event, setting up a series of follies that not only illustrate the violence inherent in this type of society but the anxiety even those in the highest positions of power have. The Death of Stalin shows humans at their lowest and most despicable conniving against one another and… it’s hilarious. Part of perfecting any comedy is ensuring that beyond the writing that the pitch and tone are uniformly succinct from the cast. 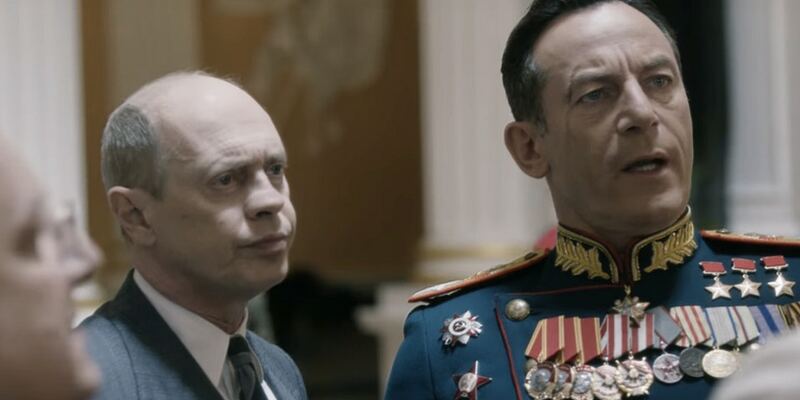 Any comedy be it screwball, black, satirical, political, angry, all of which The Death of Stalin is, relies on its Cast more than any other genre. They will make or break whatever intent a writer and director have for a scene if not the movie en masse. The ensemble cast led by Steve Buscemi, Michael Palin, Jeffrey Tambor, and Simon Russell Beale are near perfect in tone and performances. Special note should be made of both Rupert Friend and Jason Isaacs who steal the entire film in their all-to-brief appearances. A rare feat that Iannucci manages to have such a large cast be in perfect unison with the tone of the entire film. Not one performance rings false. Even the roles of faceless soldiers that are to guard some and execute others are pitch perfect in their deadpan comedic deliveries. The film at 107 minutes is paced like an action film never slowing down to catch its own breath let alone’s letting the audiences do the same. That breathless pace belies something deeper, darker, and more sinister at play in the film. Iannucci understands any biting satire or dark comedy, the serious must be serious. In its last twenty minutes, the film is equal parts hilarious and silence inducing serious. This rare combination takes The Death of Stalin from just a good comedy but a great one. The Death of Stalin is in limited release beginning March 9th.